Should I buy a used dehumidifier? • The Air Geeks, reviews of air conditioners, dehumidifiers and air purifiers. 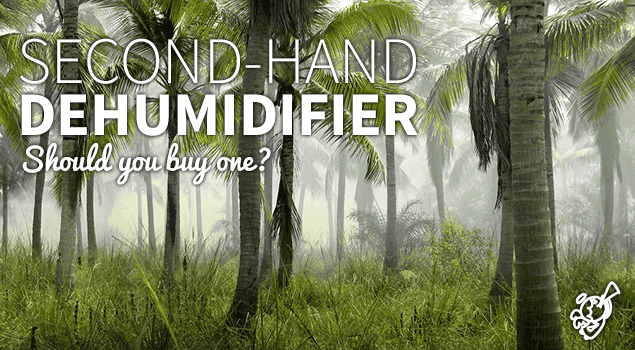 Blog, Dehumidifiers » Should I buy a used dehumidifier? Should I buy a used dehumidifier? A dehumidifier draws excess moisture from the air in your room to ensure that it has a truly comfortable environment. In addition, by maintaining the relative humidity of your room within a desired range, a dehumidifier helps to prevent growth of mold and mildew. Excess moisture can also cause your furniture and other valuables to rot or corrode. If you have been experiencing this problem, then you need to get a suitable humidity control system. If you are already planning to buy a humidity control system and you are undecided if you should purchase a new unit or a used one, then you have come to the right place. We have explored the pros and cons of buying a used dehumidifier to enable you to make a well informed decision. Without wasting time, we will start by looking at the advantages of buying a used dehumidifier. To start with, a used dehumidifier is cheaper than a new one. This factor makes used appliances a suitable choice for people with limited budgets. Depending on the length of time that the item has been in use, you can get a unit that is still in good working conditions at less than half the price of a brand new one. If you search well, you can get an appliance that has been used for a short period of time. Most of such appliances can serve you for years without any problems. Getting such an item at nearly half the price of a new one can help you to save money. In most cases, the operational cost of a used dehumidifier is higher than that of a new one. However, this will depend on the length of time that the unit has been in use. If the unit has been used for years, there are higher chances that you will spend more on repairs. In almost all cases, used appliances have limited warranties. This means that you will most likely spend more on repairing a used dehumidifier. If you are not careful when selecting a used humidity control system, you can end up spending more than you would have spent on a new unit. Manufacturers are always bringing new items to the market. In most cases, new appliances feature new technologies and they are designed to offer better performance. If you go for a used item, there are high chances that its efficiency is lower than that of the latest products in the market. Furthermore, it is more difficult to get replacement parts for obsolete appliances. In addition, used appliances are less attractive as compared to brand new items. If you are planning to get a dehumidifier at a cheaper price, then a used dehumidifier is a good option. On the other hand, if you are looking for a shiny and spotless appliance, then you should go for a new dehumidifier.